wanderlust ATLANTA: ATLANTApix: Mickey is a Braves Fan! 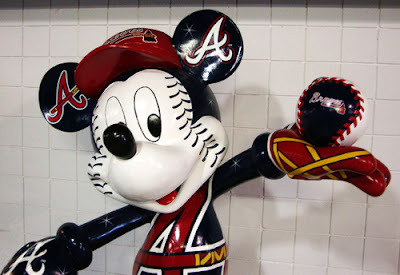 Mickey Mouse is a Braves Fan! I've been an Atlanta Braves fan since the late 1980s and it's great to know that I'm in good company. As it turns out, Mickey Mouse (photo) is also a fan! And an enthusiastic one at that. Mickey is at Turner Field for every home game ready, willing, and able to pose for photos with fellow Braves fans...and he'll never blink! There are lots of other distractions to enjoy when visiting Turner Field, including: taking a few swings in the batting cages; taking in the incredible view of the Atlanta skyline at the Coca-Cola Sky Field; and taking a guided tour of Turner Field. And that's only a few of the 101 Things To Do at Turner Field.